Welcome from Beijing. I'm writing Future from China this week. Let me know what you think as we go. 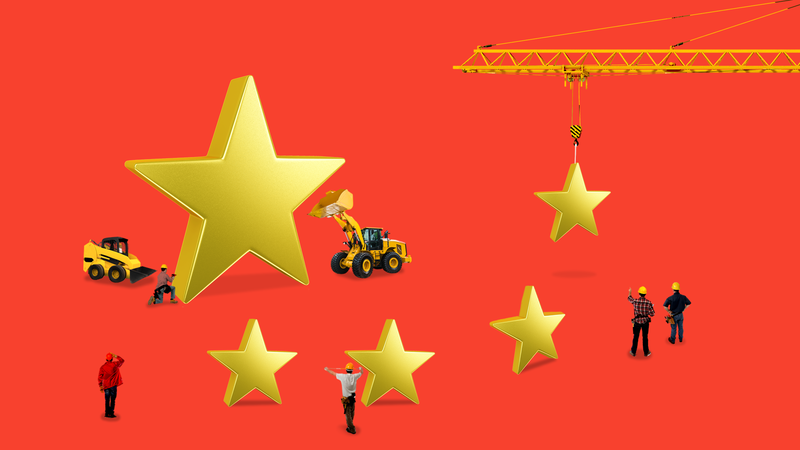 China was already building the largest single infrastructure project since the Marshall Plan — the Belt and Road Initiative, echoing planet-spanning 19th and 20th century initiatives by the British and then the United States to set the rules for global commerce. The digital highway would be "a community of common destiny in cyberspace," a vice minister of information technology told the Economist. The super-grid is even more ambitious, relying on a technology called ultra-high-voltage transmission to transport electricity along vast distances, from continent to continent, according to Andrew Davenport of RWR Advisory, a consultant firm. Go deeper: Read how Belt and Road has spooked China's rivals; how Malaysia is reconsidering projects brought by Beijing; and the mountain of debt taken on by Sri Lanka. 2. "They believe the West is in free fall"
Saturday in Quebec. Photo: Jesco Denzel/German Federal Government/Merkel's Instagram. Chinese leader Xi Jinping and Russia's Vladimir Putin are strategizing how to reposition themselves for a new, more powerful future amid a rapid deterioration of the U.S.-led global order. What we're hearing: Xi and Putin, meeting Friday in Beijing and again yesterday in the city of Qingdao, don't appear to think they have the cachet — even combined — to create an entirely new system. Nor is it clear that at the moment they would want to trash the U.S.-led institutions that have anchored the global economy and political order since World War II (see below). But look for the mutually distrustful pair to feel out ways to transition to a new world in which a loose grouping of China, Russia and their allies can become more or less the geopolitical equals of the West. In a special report yesterday, Axios' Jim VandeHei and Jonathan Swan wrote that President Trump is shaking up U.S.-led institutions. Yesterday, for instance, Trump threw down lightning bolts from Air Force One when Canadian Prime Minister Justin Trudeau dared challenge him on trade. He angrily tweeted that he withdrew the U.S. signature from a just-finished G7 Summit communique. Such spectacles feed Xi's and Putin's conviction that "the West is in free fall," says Mathew Burrows, former counselor at the National Intelligence Council, and now at the Atlantic Council. "Both Xi and Putin have been surprised and shocked by the rapidity of the US decline." "We’re descending fast into a Hobbesian world. Only the US think tank community believes it can restore the liberal rules-based order: Such grand illusions!" How this new world might look: As discussed above, China's long-term vision is a world structured within its various big infrastructure initiatives. But Ian Bremmer, president of Eurasia Group, tells Axios that he does not see Xi and Putin for now attempting to replace the post-war multilateral architecture. "They both see opportunities, to be sure," he said. "Russia — to undermine the U.S. and divide the west. China — to expand their political and economic influence globally." For years, an unwavering certitude of industry, think tanks, demographers, policy-makers and city planners everywhere has been that humanity, led by millennials, is moving to the city: We just needed to figure out how to house, employ and feed everyone in a condensed space. What's happening: The forecast of global massive urbanization was important since it suggested that vast swaths of countryside would empty out, and we would adopt entirely new lifestyles. But, in a mea culpa at Brookings, William Frey, a demographer and believer in the trend, said that, based on new census data, he has changed his mind. He still thinks that cities will attract "young people — especially well-off, affluent millennials and post-millennials." "But this won't be most cities," he tells Axios. "And, for this younger generation, what I see is more clustered developments within the suburbs, and smaller metros, greater reliance on public transportation and perhaps ride-hailing and self-driving cars." What happened: Frey said it might be "just a 'return to normal' of the suburbanization we saw prior to the Great Recession." But Karen Harris, managing director at Bain Macro Trends, tells Axios that, for one thing, it's probably time for millennials — given their stage in life — to start moving out to the 'burbs with their kids. Harris also says that very few experts took note of the changed economics of distance. Last week, Axios' Jonathan Swan asked Peter Navarro, Trump's trade adviser, to respond to critics who say steel tariffs are excessive — that most countries are not doing America wrong on trade. In Swan's resulting post, Navarro said his critics are wrong to say that steel jobs are rightly passé. "We on Team Trump are astonished by the argument that America's future is in the services sector, and Americans don't want 'dirty' jobs in steel furnaces," he said. Navarro went on to advise them to "get out more often to the Heartland and see what Main Street and Trump country really look like." The bottom line: "Even places that voted most strongly for Trump are primarily service-producing, not goods-producing, economies." JK Growling, pedigree unknown. Photo: Brendan Greeley. Back in March, the canine longings of an 8-year-old Maryland girl became a Twitter sensation. As Brendan Greeley's daughter told him in very plain capital letters across his morning FT, she wanted a puppy. Some 189,000 people sympathized when Greeley tweeted about it, among them writer J.K. Rowling and "The Wire" creator David Simon. 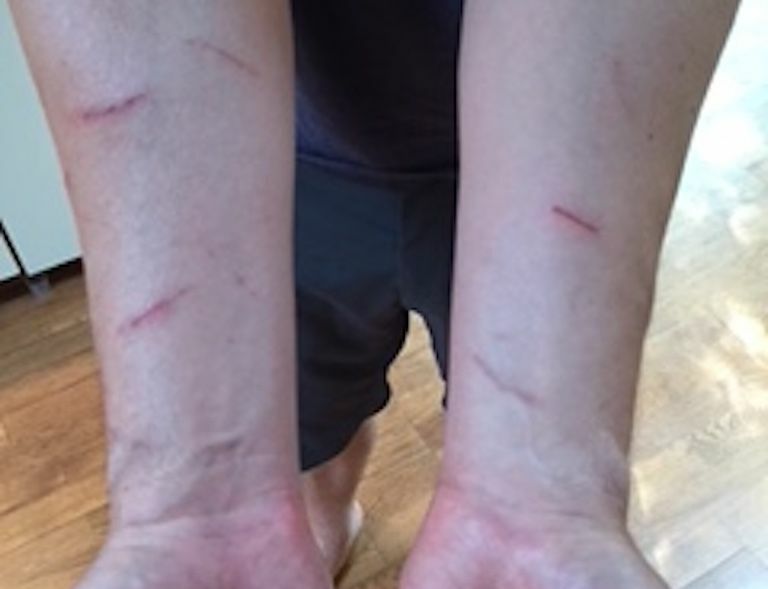 So it is that, three months later, Greeley wears his long shirt sleeves rolled up near the elbows to let the air heal the bloody scratches and digs inflicted by JK Growling, the new family puppy. These wounds are part of diverting Growling's alpha instinct: Greeley and his wife Beth are attempting to teach their children how to let the pup know he isn't leading this particular pack. "He's aggressive," Greeley told me. When the family took Growling home from the local SPCA, Greeley thought he was a shepherd-Labrador mix. Now, he reckons he might have some pit bull, too. "No good deed goes unpunished," Greeley said.